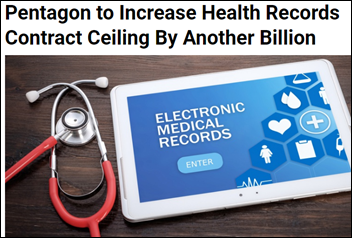 The Department of Defense will increase its EHR contract ceiling by $1.1 billion in expanding MHS Genesis to cover implementation of Cerner by the Coast Guard. The extra cost will also cover items included in the VA’s contract that were not present in the DoD’s agreement, according to Defense Healthcare Management Systems Program Executive Officer Stacy Cummings. The DoD’s original contract ceiling with lead contractor Leidos was valued at $4.3 billion and a total of $9 billion if all options were exercised. The Coast Guard gave up on its attempt to implement Epic in 2015 after running $46 million over budget with no sites live. A GAO investigation blamed poor project management, insufficient governance, inadequate project documentation, lack of testing, and internal staff turnover. 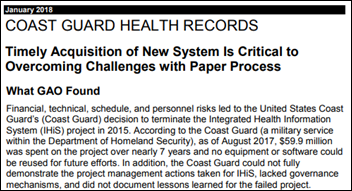 The Coast Guard began searching for an alternative to Epic in February 2016, reverting to paper and, according to the GAO, endangering members with convoluted processes. Cummings said the Pentagon will publish a second evaluation report by the end of the year, following a scathing internal review from May that concluded that MHS Genesis “is neither operationally effective or operationally suitable” and not capable of managing care delivery. The DoD also announced that the next four MHS Genesis rollout locations will be Naval Air Station Lemoore, Travis Air Force Base, US Army Health Clinic Presidio of Monterey, and Mountain Home Air Force Base. 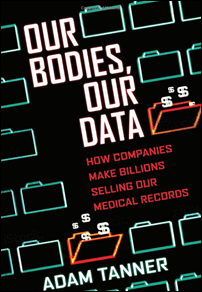 From FlyOnTheWall: “Re: Allscripts. The company’s investor page proudly boasts in a press release from last year that Rothman Ortho selected Allscripts PM to replace its ‘legacy system.’ Was not that system Allscripts Vision? Nice to see Allscripts getting into the rip-and-replace frenzy of Allscripts solutions, even though they did an RnR of one of their own products.” Unverified, but I believe Rothman was using the old Vision product of Medic / Misys, acquired by Allscripts in 2008. If that’s indeed the case, then I would categorize the announcement as misleading since it’s just swapping one Allscripts product for another, not a brag-worthy displacement of a competitor’s system. 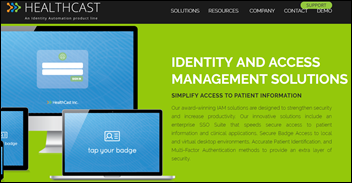 Identity and access management technology vendor Identity Automation acquires HealthCast, which offers single sign-on and virtual desktop systems for healthcare. Former employees of the shuttered CareSync describe the company’s final days to the Hardee County (FL) Board of County Commissioners, saying they were pressured to keep patients of its chronic care management business on the telephone line for at least 20 minutes to qualify them for their monthly Medicare billing. CareSync co-founder and State Rep. Jamie Grant — who served as senior solutions architect and was cleared of ethics violations after charges that he funded the company’s startup by misusing Hardee County development grants – says he hasn’t ruled out suing unnamed parties. Co-founder Travis Bond, who employees said was removed by the board because of poor financial management, says he does not plan to pursue litigation. Cerner has added half of the 600 Kansas City-based employees it needs for an expansion of its RevWorks and ITWorks outsourcing businesses. University of Minnesota hopes to license an algorithm created by its medical school researchers that predicts a patient’s one-year mortality risk using EHR data. DirectTrust hires Scott Stuewe (DataFile Technologies) as president and CEO. He worked for Cerner for 20 years through December 2016. Methodist Health System (NE) promotes Kent Sona to VP/CIO. 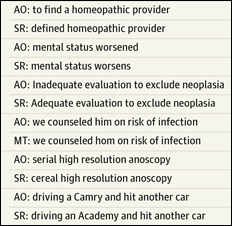 A Reaction Data survey of 250 physicians finds that EHRs, regulatory compliance, and internal bureaucracy contribute most to their burnout, with patients named as the problem only 2 percent of the time. The top wished-for EHR improvements are improved user friendliness, additional dictation or scribe capabilities, and reduced time required. A Black Book survey finds that two-thirds of hospitals are reconsidering whether the ED information system supplied by their EHR vendor can handle efficient ED workflows and meet consumer expectations, with outsourced ED doctors being the least satisfied due to EHR training gaps, excessive clicking, and difficulty in obtaining outside patient data. 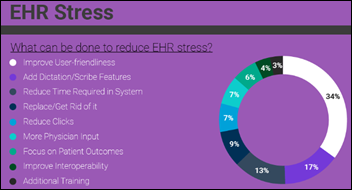 ED doctors who were forced to move from a best-of-breed EDIS to an EHR’s ED module say their new system hurts their productivity (90 percent), impedes patient workflows (75 percent), and contributes to medical staff burnout (90 percent). CIOs are mostly at odds with those beliefs, favoring a single source EHR solution. The top-rated best-of-breed EDIS vendor is T-System, followed by Optum Picis and Wellsoft. Cerner, Meditech, and Allscripts were also highly rated by users. The most-desired features of both types of EDIS in order are better mobile deployment, interoperability, and patient satisfaction tools. The Senate confirms Robert Wilkie as VA secretary in a 86-9 vote. The National Institutes of Health launches its Google Cloud-powered STRIDES Initiative to allow researchers to analyze large biomedical data sets. Meanwhile, a Google Cloud blog post says that former Cleveland Clinic President and CEO Toby Cosgrove, MD has signed on as an advisor. A small JAMA-published study finds that back-end speech recognition (specifically Nuance’s former EScription product) has a 7 percent error rate when creating dictated notes (operative notes, office notes, and discharge summaries), with some of those errors such as “grown mass” instead of “groin mass” remaining on the chart for weeks or sometimes indefinitely as clinicians either don’t review them promptly or sign them without double checking. The authors recommend that speech recognition errors be submitted for calculating error rates and for creating automated error detection systems. Banner Health posts a job for CEO of its Tucson campuses just after its corporate VP/CIO announced plans to leave and the local paper published documents from a state investigation into problems with patient care, provider satisfaction, and billing from its Epic-to-Cerner conversion at the former University of Arizona Health Network hospitals in Tucson. Google’s Nest home automation division is approaching eldercare facilities to use its products for monitoring the wellbeing of residents. A Stanford University scientist invents a patch that measures cortisol in sweat to detect disease, measure stress, and evaluate sports performance. 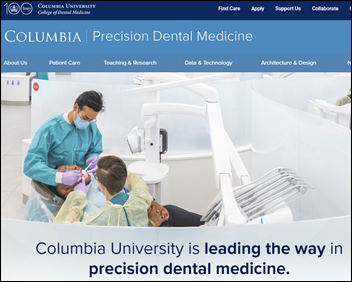 Columbia University’s new Center for Precision Dental Medicine offers RFID tracking of patients and equipment, biofeedback-measured stress levels for quantifying pain, video recording of procedures, and all-digital dental chairs whose six instruments are RFID-enabled for tracking usage and sterilization. They hope to use the resulting data not only to make patients more comfortable, but to analyze provider technique to identify best practices. They also hope to to integrate their systems with EHRs to remove the silos between professions. Ellkay will exhibit at AACC’s Annual Scientific Meeting & Clinical Lab Expo next week in Chicago. Iatric Systems will exhibit at the SHIEC Annual Conference August 19-22. In Ohio, the MetroHealth System and Medical Mutual become the first provider and payer organizations to digitally exchange data and documents with Hyland’s OnBase Mackinac solution. Audacious Inquiry names Roxanne Johanning health IT product manager. Arcadia will host a career open house at its Pittsburgh office July 25. CompuGroup Medical will exhibit at AACC July 29-August 2 in Chicago. Epic has stopped building facilities, none in the plans. I also have not seen any adds to hire tech staff in months. Only cooks and bottle washers. Could Epic have reached its Apex? Also, I think there are plenty of companies that experience growth without constantly having construction projects underway – it’s possible they’ve built beyond their current capacity to accommodate projected growth without needing to continue building more right now. HISJunkie, I believe a better description is EPIC may have hit their “cursing speed” no where close to descending yet. There are only a few none factor vendors who have crashed or missed the EHR stimulus all together. I’ve worked for a few companies that definitely reached that level. Daughter of a friend started at epic last month and told her parents she was one of several hundred new hires. Perhaps they have enough space in the current floor plan for growth? I imagine that at their size, 10,000, there will be steady hiring just to deal with natural attrition, which is naturally high anyways considering the travel, early career types, etc. Replacing turnover is not growth. It’s steady state at best. The old adage in the tech business is “When you stop growing, you start to die”. Technology keeps changing and to keep up with the investments needed you need growth. Now, I am not saying Epic is imminent danger of demise, but in my experience it is the long slow (maybe very slow) slide to oblivion… usually via acquisition. There are plenty of examples out there: Sun Micro, SMS, McAuto, HP, and companies like GE, IBM, Siemens (SMS) have routinely sold off divisions that stopped growing.